I have a girlfriend who is caught between faith and a hard place. Though she is a committed Christ-follower she struggles to believe God’s promises and feels helpless to the circumstances of her trial. She prays – but wonders if God no longer listens to her - daily looking for the light at the end of the trial-tunnel, yet seeing none. Have you been there? Are you, or is someone you love, there now? God’s ways and timing are mysterious – no doubt. At times, His ways can even seem frustrating. But He is good. He graciously provides strength and hope when we call on Him... but waiting on God can be such a difficult spiritual discipline. Elijah was the most dramatic and famous of all Israel’s prophets. God worked in and through him powerfully and miraculously, but even Elijah went through seasons of waiting and wondering – just like my friend. Just like each of us. Write this verse out: “Look to the Lord and his strength; seek His face always.” (Psalm 105:4) Keep it handy. Read it out loud. Speak it to your heart. Memorize it. FREE E-BOOK: If you’re like most women, you have things in your past that you’d like to forget or things in your present that are stressing you out. The result? Pain. Shame. Frustration. God is all about healing, restoration and peace. 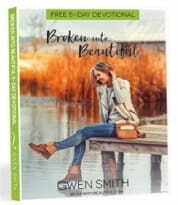 Gwen’s downloadable FREE 5 Day Broken Into Beautiful e-book will help to move your heart in this direction of hope. CLICK HERE to download yours now.